During the Democratic National convention for the US Presidential Election of 2012, Elaine Brye, a “Military Mom” introduced the American First Lady Michelle Obama. Elaine is a “Military Mom” as of her five kids, one each is serving in the Army, the Navy, the Air Force and the Marines.. Will this ever happen in India in the near future? Many a times the President of India remains seated while the widow/parent of a posthumous recipient of Paravam Vir Chakra is standing while her husband’s/ son’s citation is read prior to presenting the award, No secret that America is the world leader. A few years back, after an attack on NATO troops in Afghanistan, all the national flags in Canada and US were observed flying at half-mast, paying respect to the fallen soldiers. There were announcements on the media to fly the flags at half-mast and all citizens did it out of sheer respect for that unknown fallen soldier. Some may claim that death is part of the job in the armed forces and there is no need to go into mourning every time for a fallen soldier. Please remember what French Nobel laureate Albert Camus said “Martyrs, my friend, have to choose between being forgotten, mocked or used. As for being understood: never”.The least we can all do is to pay our respect to the fallen soldier and what better way than flying our Tri-Colour at half-mast. It does not cost anything, but surely enhance our national esteem and pride. Field Marshal Sam Manekshaw, the General who lead the Indian Army during the 1971 Indo-Pak conflict, and a hero of the young of that time, died at Ootty in June 2008. Only the Minister of State for Defence represented the Central Government at the funeral. The reason given – Field Marshal being a new appointment created after 1971 war – did not find a place in the warrant of precedence. While Manekshaw was in the hospital in Apr 2007, the Defence Secretary handed him over a cheque of Rs11.6 million in back wages from the time he assumed the rank of Field Marshal in 1973. Even though on his death bed, Manekshaw in his usual humorous way asked the Defence Secretary whether he would have to pay taxes on this. Manekshaw being a true soldier, never made any claims to his unpaid salaries and never came on the media to make it into any issue. What a shame – this can happen only in India. One always wondered as to why we did not see the Tri-colour on Indian streets, atop homes, in the shopping malls etc like the Red Maple Leaf flag in Canada or the Stars and Stripes in the US. Our constitution was amended to cater for flying of the National Tri-Colour by one and all – (Courtesy Sushmita Sen and Sachin Tendulkar and Naveen Jundal). Have you ever seen the Indian Tri-Color fluttering in the schools, government offices, or at homes in India? Its pertinent to point out that the Indian Army units and Indian Naval Ships always fly the Tri-Colour, all Indian Air Force aircrafts have the Tri-Colour painted on them. It is sad to note that our national carrier has the Tri-Color painted very insignificantly, compared to the logo. 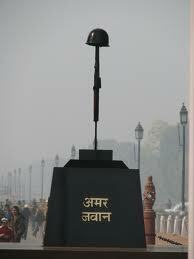 If we do not fly the Tri-Colour, then there is no need to fly it at half mast for the fallen soldier. May be the Common Man is still not aware of this aspect of flying the Tri-Colour, may be schools are not educating the students about the importance of flying the Tri-Colour, may be that out text books have not been amended. The reasons may be many, but the solution is simple – educate the common man, make him aware and teach him to develop national pride. Recently I attended a Dolphin show at Los Angeles, and behold, the show begun by paying homage to all NATO fallen soldiers. Further they made all serving soldiers and veterans and their family members to rise in their stands, so that the crowds could pay their respects. The crowd spontaneously rose on their feet with a loud applause. Why can’t we have such acts? I am sure that the Indian common man is much more patriotic and emotionally charged towards any national issues than anyone around the world. This aspect has been demonstrated time and again by the common man– during any aggression on our borders, national calamities and during the cricket matches. Someone needs to tap this potential of the common man. Who else other than the visual, audio and print media who can do a better job? Even if ten percent of media time and newsprint wasted to discuss the issue of the political murders could have been used to highlight the sacrifices of our soldiers; we would have achieved wonders. Nowadays many veterans are carrying out presentations, shows and talks across the country – from corporate boardrooms to educational institutions. It’s high time at least the veterans begin by paying respect to our fallen heroes and soldiers, like the presenter at the Los Angeles Dolphin show. May be for all you know, this presenter may also be a US veteran. The cinema industry has contributed enormously towards educating the masses about various national, social and political issues. Some movies did justice in bringing forth the sacrifices and services rendered by our soldiers. I conclude with the patriotic song from the movie Hakeekat करचलेहमफ़िदाजान-ओ-तनसाथियों,अबतुम्हारेहवालेवतनसाथियों (Kar chale hum fida jaan-o-tan sathiyon, ab tumhare hawale watan sathiyon) (Thus did we set off friends, having sacrificed life & limb, The freedom now, of this land, Is but within your hands).